Featuring lovable characters, brilliant animation, and heartwarming messages, The Fox and the Hound is "Vintage Disney," raves The Washington Post. 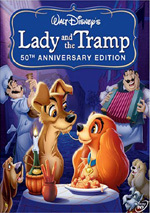 And now, Disney's classic tale about an unlikely friendship is available in a special 25th Anniversary Edition. When a feisty little fox named Tod is adopted into a farm family, he quickly becomes friends with a fun and adorable hound puppy named Copper. Life is full of hilarious adventures until Copper is expected to take on his role as a hunting dog - and the object of his search is his best friend! Those lines of dialogue have resonated through my mind for the past 30 years, ever since Disney's The Fox and the Hound originally graced movie screens in 1981. Back then I was only 14 and definitely not a Disney fan. I thought these lines seemed insipid and pointless and showed that Disney's movies were dopey and inane. I may be much older now, but I'm also much fonder of Disney movies, so many of my attitudes toward their animated offerings have changed. Unfortunately, I was pretty much correct about Fox, as it offers a pretty inert flick. Granted, that's about what I expected - I never anticipated that it would offer a thrilling or delightful experience - but I must admit I'm still a bit disappointed. I really do like Disney animation, and because I'm a contrarian, I hate to acknowledge that the common wisdom which states that Disney animated films from 1970 through 1988 all were pretty weak seems correct. The years between Walt's death and the studio's revitalization with 1989's The Little Mermaid never were better than decent at best. Fox fits in perfectly with the mediocre fare that followed the loss of Walt in 1966. The studio just seemed to run on autopilot. Plenty of experienced animators were still on hand, but it appears that they may have been lost without Walt's presence, even though he hadn't been very active in the animation studio for a number of years prior to his death. Fox was actually the farewell piece for legends like Wolfgang Reitherman, Ollie Johnston and Frank Thomas; it's too bad they couldn't have gone out with a winner. The Fox and the Hound appears in an aspect ratio of 1.66:1 on this Blu-ray Disc. The image looked good but not stellar. Sharpness usually looked crisp and detailed, but it could be a little soft and hazy on many occasions. Most of this seemed to stem from the original material, but the elements remained less well-defined than expected and appropriate. I saw no issues with jaggies or shimmering, and edge haloes were minor at worst. Source flaws stayed largely absent – animation clean-up goofs were minor as well - and the film showed logical levels of grain. Colors tended to be muted but appear reasonably accurate and well-saturated. I thought the film’s natural palette probably should have been a bit brighter, though I felt the tones were more than acceptable. Black levels actually looked quite good - especially in the rich and deep fur of the bear at the end - and shadow detail seemed nicely opaque but not overly so. The softness made this a “B” but it was a pretty good “B” that seemed to adequately represent the source material. on’t look for much pizzazz from the DTS-HD MA 5.1 soundtrack of The Fox And The Hound. Admittedly, I didn't expect too much of audio that’s now 30 years old, but this one still seemed pretty bland. The soundfield didn’t give us a lot of material. Music showed general stereo imaging in the front, while effects were a minor factor most of the time. Some vague instances of material cropped up from the front sides and rears, but you shouldn’t expect much action to engulf you. This was a soundscape that broadened matters in a moderate way at best. Audio quality also seemed pretty unspectacular. Dialogue appeared clear and intelligible but usually came across as a little muted and flat. Effects were similarly bland and lack life, though they seem easily recognizable as what they're supposed to be. This mix offered bass response that could be too prominent at times. For instance, gunshots overemphasized the LFE channel, as did thunder. That was largely a reaction to the overly sedate nature of the track, though; everything else was so subdued that louder elements came as a shock. The music appeared smooth and listenable but didn't present much spark. Granted, the fact that the tunes were all pretty low-key doesn't help, but I still found the score and the songs to lack much dynamic range. This track wasn't bad for a film from 1981, but it did nothing to make it sound notably better than other movies from that era. How did the picture and audio of the Blu-ray compare to that of the 2006 25th Anniversary DVD? Audio was a wash, as there was only so much that the lossless track could do with the lackluster stems. Visuals showed more obvious improvements, though. Even with occasional softness, the Blu-ray was notably better defined and cleaner, and the colors seemed richer as well. No one will mistake this for one of the best Disney Blu-rays, but it provided the film’s strongest home video representation to date. Though the film’s 25th Anniversary set included a mix of extras, most of these go absent here. In fact, the Blu-ray only provides one movie-specific component: a featurette called Unlikely Friends. It goes for seven minutes, 25 seconds. Most of the content comes from a narrator, but we also get some notes from Professor of Animal Science Gary Wilson. 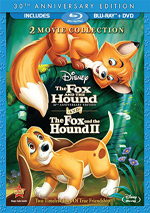 We learn about how different animals get along ala the fox/hound relationship in the movie. It’s a quick but moderately interesting piece. The disc opens with ads for The Lion King, SpookyBuddies: The Curse of the Howlloween Hound, and Dumbo. These also appear under Sneak Peeks along with clips for Bambi II, Tinker Bell and the Mysterious Winter Woods, Tinker Bell and the Pixie Hollow Games, Jake and the Neverland Pirates and Mars Needs Moms. No trailer for Fox shows up here. 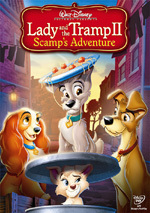 A second disc provides a DVD Copy of Fox. In addition to the film itself, this boasts some extras we don’t find on the Blu-ray. Sing-Along Songs lets us do the Karaoke thing for “The Best of Friends”. As expected, this shows the appropriate scene in the movie and runs the lyrics along with it. Yawn! Passing the Baton runs six minutes, 38 seconds and mixes movie clips, archival elements, and interviews. We hear from animators Randy Cartwright, Glen Keane, Frank Thomas, Ollie Johnston, Ron Clements, and John Musker. We learn how Fox acted as a transitional film as Disney moved from its older animators to a new breed. We hear how these changes worked and get a sense for the studio’s changes as well as some production notes about Fox. “Baton” is too short for my liking, as I’d prefer a more in-depth look at this fascinating subject. Nonetheless, we get a decent overview of the various issues. I genuinely like Disney animation, and I consider myself enough of a fan that I want to own each of their films on home video. That is the only reason why The Fox and the Hound will remain in my collection. It's not a terrible movie but it seems to accurately represent the malaise felt at Disney for quite a few years; it's watchable and occasionally entertaining but generally bland and dull. The Blu-ray provides acceptable to good picture and audio but skimps on supplements. This is the best home release for a lackluster film. 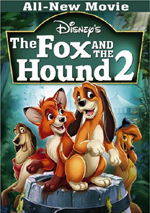 Note that The Fox and the Hound appears only as part of a two-pack with its direct-to-video sequel. Both appear on the same Blu-ray Disc; the package also tosses in standard DVD versions of the two movies.